During today's Monday morning team meeting, the focus for me (and Jarrod) is going Lamhogs. I'm pretty sure Woodspirit Handcraft is the only place offering batches of lamhogs, or even any kind of handled wooden cup in significant numbers. Last week we opened orders for Lamhogs and the pre-order list filled pretty quick. It's my job to do all the roughing out. Jarrod does the final outside shaping and the hollowing. On the subject of hollowing, that's where the Japanese style electric lathe Jarrod's building will come into play. Not having to hollow around a core will make the hollowing go a lot quicker. Jarrod's current plan for hollowing is to drill into the end grain and cut from the bottom to the top. That cut is much sweeter than the plunge cut that goes from the rim to the base. Today the drive belts for the lathe arrived. Every week that I return, the lathe has been brought along in some significant way. Some changes are small, others large. The belts are a huge step forward as the lathe can actually be used to spin wood now. 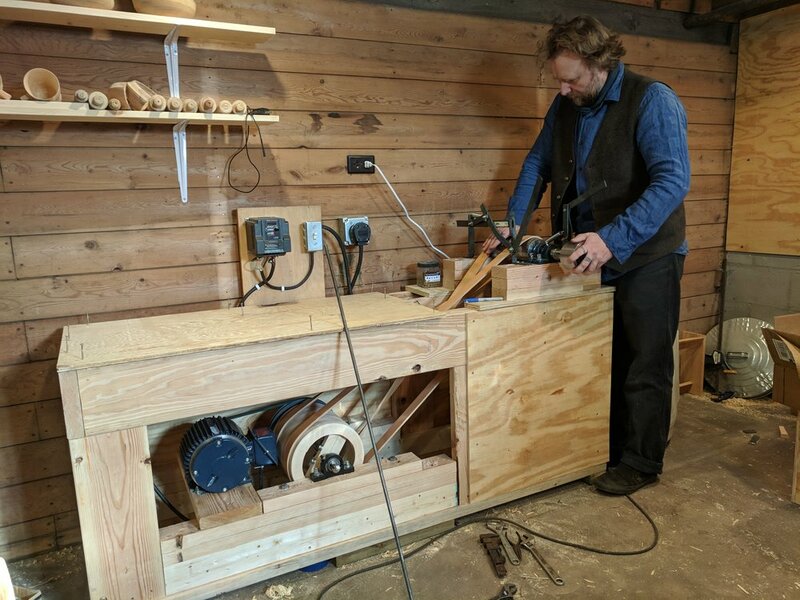 There's still a lot of work that needs to be done to get the lathe working properly, but soon, perhaps this week even, it can help speed up lamhog production. This morning however, the lamhogs that will be hollowed on the Japanese lathe were chilling in a log in the yard. I went out there after the meeting and cut two seven inch tall 'biscuits' of birch. Each biscuit holds four lamhogs. Once they're laid out, the biscuit is split into quarters. 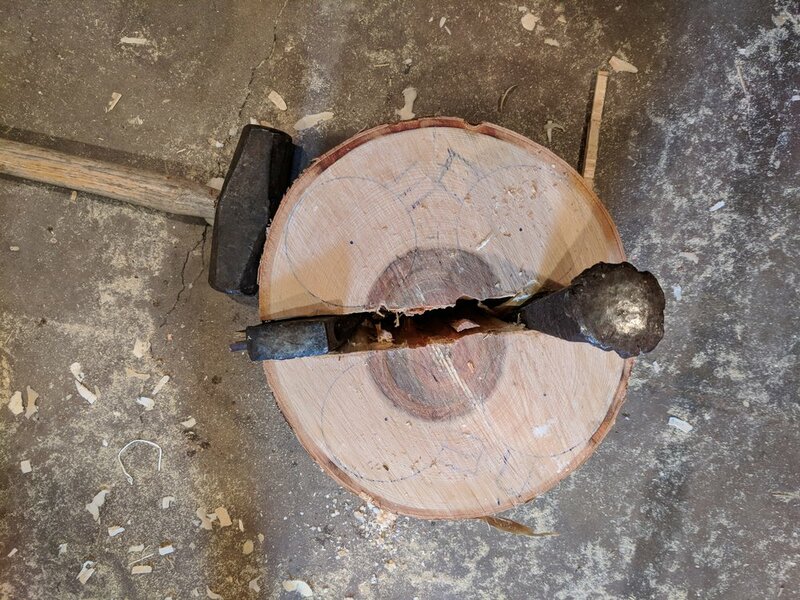 Splitting frozen wood isn't a lot of fun, as wedges have a tendency to bounce out. I use wedges to split the biscuit in half, then a froe to quarter it. I also use the froe to remove excess material around the template. Further refinement is then done with the axe. The last bit of axe work is to cut into the grain to place the handle along the side. The excess material above and below where the actual handle will be is removed and a mandrel attached. On the lathe above and below the handle is turned. This is nice and easy. 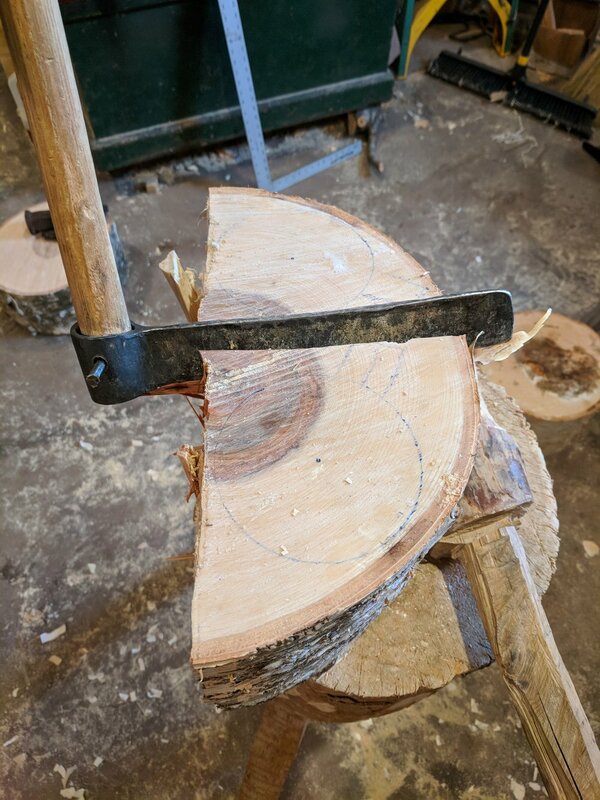 Once the top and bottom have been turned to remove the axe marks, it's easiest to split off the excess material around the handle. So it's off the lathe and back to the chopping block. Back on the lathe the material around the handle can now be turned. This is done with good tool and pedal control. You can turn nice and close to one side of the handle. To turn up to the other side of the handle the work is taken off the lathe, flipped so the mandrel is on the other side and remounted on the lathe. I then do a little bit of hollowing. This is just so I can get some practice in. If the Japanese lathe was up and running, my hollowing would help a little, but at the moment it's just a chance for me to develop my skills. Last week I rough turned four lamhogs, a fifth today, and they're all still on their mandrels, waiting for Jarrod to finish them. He's finished a couple and started work on a third today. My axe work has given us another eight blanks to go on the lathe. I think Jarrod wants to have about three a day finished, but reckons that the electric lathe might up that number to six a day. So until he's got the Japanese lathe fully functional, I've got some time to try and get as far ahead as I can on that six a day quota. I ended the day by turning a cup for myself. Jarrod gave me another tool that is for creating a smooth finish on the inside. I still had trouble getting the inside shape to match the outside, but better that the previous. Progress!